LATEST UPDATE dated 15.03.2019 : Official Cut Off Marks for UP Police Computer Operator Grade A Exam is available Now. Check category wise official cut off below…. UP Police has announced Computer Operator Grade A Online Exam result 2017. Total 1603 Candidates qualified for Next Stage. Check List of Selected Candidates for typing test/ skill test from link given below…. Uttar Pradesh Police Recruitment & Promotion Board, Lucknow eminently known as UPPRPB conducted an Online Exam for Computer Operator Grade A Post. Earlier UPP has invited Online Applications for 666 Computer Operator Grade A Backlog Vacancies for Pay Band Rs. 5200-20200 Grade Pay 2400. This was special recruitment exercise conducted for Reserved Candidates. UP Police has conducted Computer Operator Grade A Online Exam on 21 December, 2018. Information regarding UP Police Computer Operator Result 2018 is provided below……. UP Police Computer Operator Exam Result 2018-19 : UPPBPB will announce the Result for Computer Operator Posts soon. Roll No. wise List of Selected Candidates will be available on UP Police Official Website. Candidates have to take regular watch on UP Police Official Website. 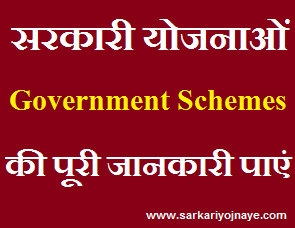 Candidates can get details of up police Computer Operator result 2018, upp Computer Operator written exam result 2018, up Computer Operator result, upp co grade a result 2018, up police Computer Operator result date 2018 details from this Page. About UP Police Computer Operator Online Exam 2018 : UP Police has conducted this Exam under Online Mode. Written Exam comprises of 160 Questions. UPP CO Grade A Exam was of Total 200 Marks. Exam was conducted under Online Mode. UP Police Computer Operator Written Exam 2018 conducted on Two Shifts each Day. 1st Shift Exam conducted from 10:00 AM to 12:00 PM and 2nd Shift Exam conducted from 03:00 PM to 05:PM. 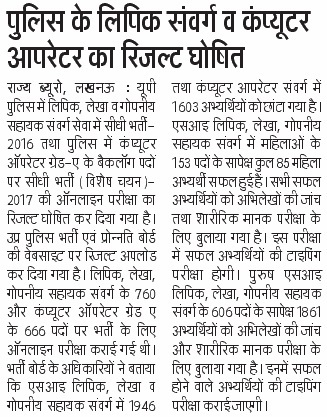 UP Police Constable Exam was conducted at various Centres in Districts. Candidates who qualify Written Test, will be called for Typing Test. Typing Test will conduct on Computer. In English Typing, Candidates has to attain speed of 30 Words per minute. Time Duration for typing test will be 15 Minute. In Hindi Typing, Candidates has to attain speed of 25 Words per minute. Time Duration for typing test will be 15 Minute. Computer Typing Test : Passage of 700 words in English and 500 words in Hindi will be given to candidate. There shall be a break of 10 minutes in English and Hindi Typing. Hindi typing will be performed on UNICODE based In-script keyboard. On Clicking that Link you will redirect to UPP Computer Operator Result Download Page. A pdf File will be opened. in that pdf file Roll No. wise & category wise UP police co result will be given. UP Police CO Aspirants require to keep in touch with our website. We will provide all Latest Updates of UP Police Computer Operator Exam Result 2018. Bookmark our website (Press CTRL+D) for Latest Updates………….